With a new year comes an increase in postage rates and we want to keep you informed. Beginning January 27, 2019, there are several postage rate changes. Postage rates are a tricky part of party planning and you always want to take your invitation to the post office to be sure you have the correct amount of postage. Our recommendation: Head to the post office NOW and stock up on those Forever stamps! Forever stamps are still valid! At least once a week, I get a phone call or e-mail from someone asking "how much are your wedding invitations?" This is such a difficult question to answer because there are SO many options! There are literally hundreds of paper and envelope choices, and then on top of that, the most important decision you'll make is the method of printing that you'll choose. The method you choose will have a big impact on your budget, and sometimes will dictate the design and type of paper you can go with. So, here's my attempt to try to help you narrow down your choices, from lowest price to highest... part one of this series breaks down digital printing. Post your questions in the comments! 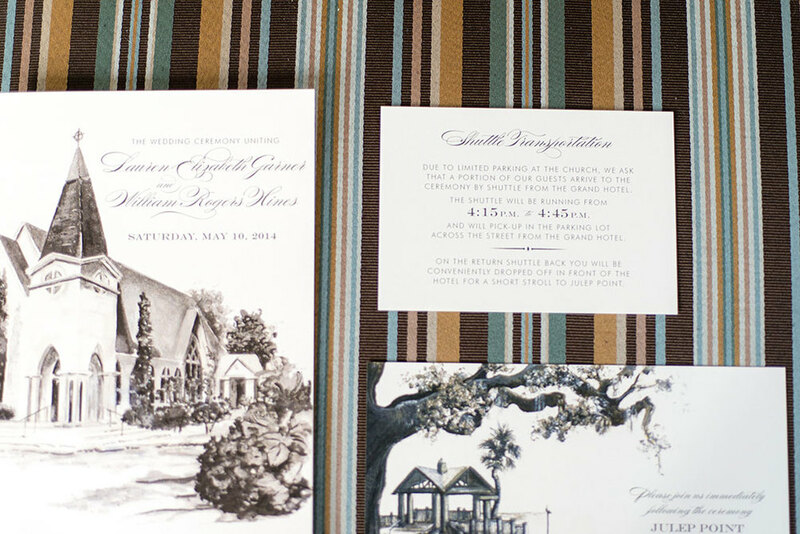 The Look: Digital printing is similar to what you would get when you print your invitations on your home printer, except with much higher quality since they are printed on a professional digital press. The Feel: When using digital printing, it is important to use a high quality paper because your invitation won't have the raised or embossed feel like you would with the other printing processes. This can be difficult because many digital presses can only accommodate thinner papers that easily go through the machine, which is why we like to layer papers for a thicker, more luxurious feel. This printing method is completely flat and takes on whatever texture the paper has. I like to use a high quality 100% cotton paper and coordinating envelopes to achieve a look and feel that is as close to an expensive wedding invitation as possible. When incorporated with a custom design by Soirée Signatures and handwritten calligraphy addressing, nobody will notice the difference! The Ink Choices: Digital printing is perfect for someone who wants to incorporate color or some kind of full color design in their invitation because the pricing includes every color of the rainbow! There are now other types of digital ink choices such as white ink, and digital foil – so you can achieve the look of foil stamping without the high cost. The Turnaround Time: From proof approval, digital invitations typically take 5-7 business days in production. The Customer: These invitations are great for brides on a budget, someone with tight deadlines, or a couple who is hosting a small, intimate wedding and is sending less than 50 invitations. The Budget: Don't get confused... "digital" doesn't always mean "cheap!" You can easily make digital invitations awesome and luxurious by layering paper and adding some custom artwork such as paintings, sketches or hand calligraphy accents. Once you've incorporated an invitation, RSVP card and coordinating envelopes, digital invitations end up being around $6 - $8 each, but could easily get more expensive the more options you choose to add. If you're looking for something on the less pricey side, we have several options available in the $3 range. The Look: Thermography, also known as "raised print," is very similar to engraving. The only difference is that the printing has a slight shine to it, and the back of the invitation is smooth. Thermography has a more formal feel without breaking the bank. The Feel: Running your fingers across the invitation you'll notice a raised lettering, resulting in an elegant, tactile effect. This is achieved by a heat process with ink and a resin powder. This printing process looks better on a stiff, matte paper – I would recommend staying away from metallic papers or anything too thin. The Ink Choices: Your choices are pretty limited with thermography when it comes to color. "Gold" ink has more of a bronze look and "Silver" has more of a charcoal look. Its hard to get pastels or light colored hues because of the process of which it is printed. The Turnaround Time: Just like digital printing, thermography typically has a 5-7 day turnaround time after proof approval. Depending on the time of year, you may run into a 7-10 day turnaround if you're printing in the middle of wedding season. The Customer: Thermography is a great option for the bride on a budget who wants a more formal look and feel for her invitations. The Budget: This process is a cost-effective way to achieve the look of texture without the added costs of plate-making. You are charged "per color" with thermography, so sticking with a single color will help with budget concerns. Again, depending on the paper choices and number of envelopes and inserts, you can expect to spend anywhere from $7 - $9 per invitation and up. Digital Invitations that Do Not Disappoint!